Expressions Art Glass is a family owned business, with husband and wife team Andy and Jennifer Cole teaching most of the classes, running the shop, and Jennifer designing the art glass. We specialize in instruction and design, and focus on offering the largest, most complete selection of art glass and supplies in Southern Arizona. Jennifer has been working in art glass professionally since 1983, and Andy since 1989. We love teaching classes, and really enjoy getting to know our students. We treasure the relationships we have built over the last 28 years, and still see many students / customers / friends from over 20 years ago coming in to buy supplies and take classes. Expressions endeavors to provide classes which are interesting, fun and informative. Our class atmosphere is generally lighthearted, yet structured, and students enjoy great camaraderie. We've delighted in seeing numerous friendships develop during our classes over the years, and our lives have definitely been enriched by getting to know so many of you. Jennifer has published two design books, "Contemporary Southwest Designs", and "Southwest Designs II", which have been very popular nationally and overseas. Her stained and fused glass artwork can be seen all over Tucson, and her designs have inspired many stained glass artisans all over the US and beyond. While working at Ochoa Stained Glass in the 1980s, she was commissioned by the Vatican to create a large stained glass window and Tabernacle for a home on Lee Street where visiting priests reside. Other works of interest include a large stained glass installation at the Tucson VA Hospital Meditation Room, incorporating handrolled art glass and painted, fused glass. We try to keep abreast of all the latest tools, information and techniques so that we can offer our students and customers the best service possible. Art glass is our passion, and we enjoy working on projects "after work" as well. We love helping people bring their visions to life in glass, and we look forward to discussing your next project with you. 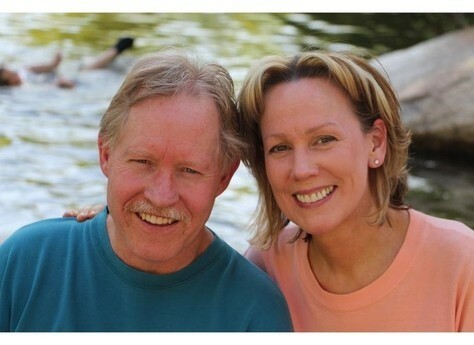 In addition to running Expressions Art Glass and Firefly Glass Gallery, Andy and Jennifer are very active in their church and mentoring people in a Biblical approach to managing finances through Crown and Compass Ministries. A portion of Expressions' proceeds goes to support local ministries including Gospel Rescue Mission and Teen Challenge of Arizona.